The LA Chock is a superior motorcycle support system that combines the ease of hands-off operation with extraordinary safety and security. Simply roll or ride the motorcycle into the Chock and the patented mechanism firmly grabs the tire and holds the motorcycle upright. Just two straps on the rear securely hold the bike for transport. 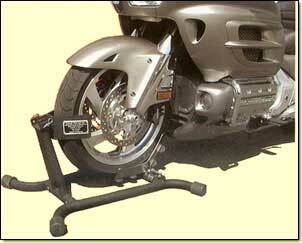 Adjusts easily to fit any size tire.